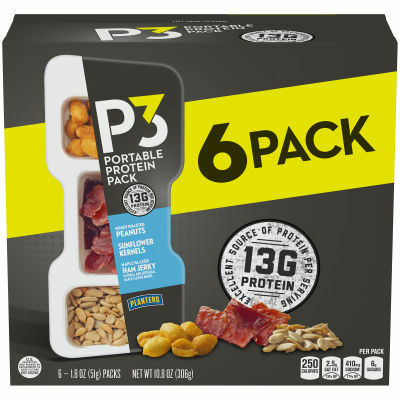 The Perfect Combination of Crisp and Crunch - This Planters P3 portable pack contains a delicious mix of crunchy honey roasted peanuts and sunflower kernels with the crispiness of maple glazed ham jerky. All three ingredients are packed with protein to give you a mid-day . This beautiful combination of crisp and crunch enhances each flavor in the mix. Great for All-Day Snacking - Each pack of Planters P3 Honey Roasted Peanuts, Maple Glazed Ham Jerky and Sunflower Kernels boasts an exotic taste you just can’t say no to. With this portable 6-pack, you can treat yourself at work, school or on the go for anytime flavor. Serving size 1 Pack (51g).